Guide on how to effective 3 stars any TH7 or TH8 base with our CoC Clan War attack strategy using Dragon, Hog, Lightning, Heal and Rage Spell. In this guide, we will be focusing more on Clan War attack strategies for TH7 and how you can effectively get 3 stars from any TH7 or TH8 base. 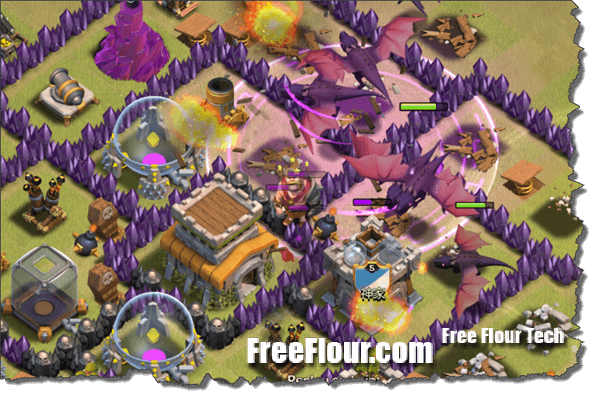 Depending on your opponent’s base layout and Town Hall’s level, the attack strategy you should be using may vary. This is the most common and the most recommended attack strategy for TH7 vs TH7, or sometimes even for TH7 vs TH8. This strategy is what makes the game boring during the TH7 phase because it is always going to be a guarantee 3 star every single time when you attack a TH7 with this strategy. Even with the recent update which introduces the air sweeper, it’s still the most effective attack strategy against any TH7. Drop 3x lightning spell to take out one of the air defenses. Pick the one that you think it’s harder for your dragon to reach. Summon dragon in a straight line or at least wide enough for them to push together. If you hold a single finger to drop all your dragons at once, they may circle around the base and may not reach the air defense. Drop your BK for assistance in cleaning up the remaining buildings. You will need at least Lv3 lightning spell to take out an air defense of level 5 or higher. Make sure to zoom in before you drop your lightning spell for better accuracy. If you fail to destroy the air defense, your attack may fail. Your main objective is to take out the air defense as quickly as possible. You can use 10 dragons and get another one in the CC, or 9 dragons with 20 archers for bases that have builder hunts at all the edges of the base. If you have someone in your clan that can donate lv6 balloon, they are the best choice for dragon attacks. If you are attacking a TH8 that has an air defense expose near the border of the base, use hogs to take it out first and then use your lightning on another air defense. You can then ensure a 3 stars from that TH8. You don’t even need to lure their CC (castle clan) troops. 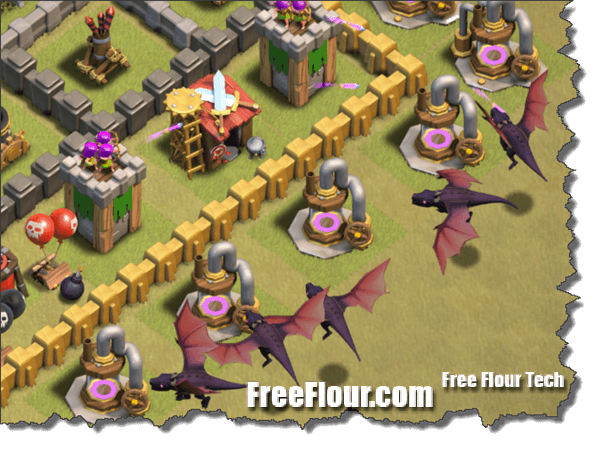 It’s just how powerful your dragons can be against any base that have lesser than 3 air defenses. This attack strategy is mainly for when you attack a TH8, preferably low to mid TH8 with air defenses of not higher than level 5. If you are to attack a TH7, it’s not worth risking to use this strategy since the lightning one can always guarantee a 3 star, unless if you never research your lightning spell high enough to destroy the air defense. When you are attacking a base with 3 or more air defenses, lightning will not be as effective (depending on bases). By using 2 Rage and 1 Heal you will have better chance for bases with 3 air defenses. Drop your dragon in a straight line or wide enough for them to push together. Do not hold and summon all your dragons in a single place or you will fail the attack miserably. When your dragons reach the air defense attack range, drop your rage spell so they can quickly break whatever that are blocking their way to the air defenses especially the storage which has high amount of hp. Drop heal when necessary. Heal is very situational and requires more experience to effectively use it. I use it when my dragons triggered seeking air mines. Drop the other rage when they reach to where the air defenses are placed. Drop your heroes to clean up the remaining buildings. You will need level 2 dragon to successfully get a 3 star from a TH8. If a TH8 is very maxed out with 3x level 6 AA and very well placed air sweeper, try not to attack it. Dragon with Rage and Heal spell requires luck most of the time and of course your experience in using it. The more you use dragons, the better you are in predicting where the dragons will go. It’s all about dragon’s routes, where they would go and how to get them to the air defenses ASAP. Use 2 dragons to break the side building to funnel your dragons to the middle. You can also use your heroes to break the side buildings to help with the funneling. If there is any air defense expose near the border of the base, use hogs to take it out first and then you can guarantee a 3 star. Hogs attack strategy is pretty rare for TH7. They are only useful when they reach level 4 which are obtainable during TH8. However, if you are attacking a TH7, Hogs level 2 may still work. You will need at least Level 3 Heal spell and level 3 or higher Wizards. Your troop composition will be 20-30 Archers, 3-5 Wizards, 3 Heal spells and the rest Hog Riders. Lure your opponent’s CC troops out and kill them with your Archers. You must do this step otherwise it will be a guarantee fail attack. Kill the opponent’s barbarian king first whenever possible. Drop hogs in 2 or 3 points of summons. Preferably a side opposite of where your opponent’s barbarian king is placed. Drop your Wizards behind to start cleaning up as soon as you finished dropping your hogs. Time matters a lot for this strategy. Now this is the most important part. Look closely at your hog’s HP, drop heals when they get lower than 60%-70% of HP because anywhere lower than that can be killed by a single Giant Bomb. Drop heal before they reach a location where you think there may be a giant bomb or two. If your hogs trigger 2x giant bombs at once, they will die instantly and there’s nothing you can do about it. Try not to attack any base that you think there might be a double giant bomb side along the way of the defenses. Choose a base that is very compact and have no space in between the defenses. Hog riders’ weaknesses are only traps and heroes. Once the threats are eliminated, a 3 star can be guaranteed. This strategy may work beautifully and get you a 3 star, or it can turn out to be a nightmare and get you zero star. Using hog riders is quite risky. Use it only when you think you can guarantee 3 star a base. We have many more other Clash of Clans clan war attack strategies and basic farming guides listed in this page: Clash of Clans Attack Strategy Tips and Cheat Sheets. If you like this guide, follow us on Facebook or Twitter to get the latest clash of clans guides and updates.